David Wise is a living legend for many Nintendo fans, having contributed some amazing music to a dazzling array of classic Nintendo releases - the most famous of which is arguably the Donkey Kong Country franchise. Wise has since gone freelance but composed the fantastic soundtrack to Retro's Donkey Kong Country: Tropical Freeze a short time ago. We're now hearing rumours that Wise - who hasn't been heard from much since Tropical Freeze - is currently working on an unannounced Nintendo project. The source of this info is Donkey Kong podcast The Kongversation, hosted by DK Vine - which, we should warn you, contains some bad language. During the segment, the hosts Chad and Hyle also point out that we know Retro Studios is not currently working on a new Metroid game - so could Wise be teaming up with them again for something Donkey Kong-related? There have been rumours that Diddy Kong Racing 2 is in development for the NX - but the same source also thinks that Nintendo's next machine will launch at $150, so a pinch of salt may be required. We'll let you make up your own mind in this case, but our fingers are firmly crossed that Wise is indeed working on something cool for the Big N once more. If you're a fan of the man himself, be sure to check out our interview with him prior to the release of Tropical Freeze. In before "Diddy Kong Racing 2 " for NX rumors explosion in the following comments... and GO! "There have been rumours that Diddy Kong Racing 2 is in development for the NX - but the same source also thinks that Nintendo's next machine will launch at $150, so a pinch of salt may be required." As much as I'd love DKR2, I don't see how it makes much sense. The Wii U library is so small and already has a Nintendo kart racer, so is there room for another one to sell big numbers? And if you want a big name for the NX launch and its a kart racer... It would be Mario Kart, no? DKR isn't a big name like MK. Maybe another DKCR platformer with Diddy playing the starring role? Also why is every unannounced title thought to be an NX title? Iwata himself said their priority was satisfying Wii U owners. @1wiierdguy lol have you seen the E3 Digital Event? They didn't announce ANY substantial new games for Wii U. @Peach64 - I was thinking that if NX is backwards compatible, and the eShop is forward compatible? Then DKR2 could make sense. Release another batch of DLC for MK8 and keep it relevant for NX launch but have a new, NX only, DKR as a launch title. Then a NX MK9 could be released later on in the console life cycle. Maybe these Diddy Kong Racing rumors that are circulating are for a Retro-designed MK8 dlc pack. That would make more sense than a full-fledged game. @BLPs I AM a Vita owner I guess Axiom Verge will be the last game I'll play on it. @1wiierdguy - some of the development teams have to be working on NX titles.....but I do think Nintendo has a few surprises for Wii U games. It wouldn't surprise me to see 3 or 4 exclusive 3rd party games make their way to Wii U to help fill out the next few years. @1wiierdguy Satisfying Wii U owners in Iwata's mind doesn't necessarily mean more Wii U games. There could be some sort ambassador program on NX for Wii U owners if you buy before a certain date. @errantrazor I'd much rather have that setup, I'd love to see Wii DK's Snowboard Cross return in MK8! Is DK a massive selling for Ninty like Mario? If it is then it's a new DK for the WiiU or 3ds. Or DKR2. Idk, I still need to play tropical freeze , its super hard, and I have waaaay too many WiiU games to get through without being stuck on one for ages that's a good thing. @BLPs Yes, I didn't expect anything. The last retail game I bought for Vita was Tearaway. And that was in 2013. Am I the only one who thinks retro would be wasted on dkr2?.no offence but am sure there's another team who could make a good kart racer.let retro do the Mach rider reboot or new ip they pitched a while back. How long into the development process do they typically start working on the music? @Ichiban take my money now! I'm not a video game music aficionado by any means but the original DKC soundtracks were/are amazing, everything i've heard from this guy is unreal. That Yooka-Laylee kickstarter tune is awesome. But definitely lack of AAA first party games. @BLPs @SirQuincealot XenobladeX' soundtrack was finished in 2012 and the game had about 2 more years of development time, just to name an example. I'm not optimistic, but I don't think it's reasonable to say that we know Retro isn't working on a Metroid game. Nothing in Tanabe's comments really demand that. I will take this with a grain of salt but if it is true that would be excellent! All I hope is that it isn't another Donkey Kong Country Returns game. I would also be against the idea of a new DKR game because we already have Mario Kart 8, but the original rumors I read about DKR2 said that it would feature lesser known Nintendo stars as the other characters, and honestly, that just sounds like a blast to me. And another DK game. Great. What if they could be making another 3D Donkey Kong game? like Donkey Kong 64? Haven't had any games like that in a while. So is it safe to assume now that any unannounced game in development for a Nintendo home console is coming to the NX? That's just sad. On a positive note, David Wise makes my earholes sing with joy. Retro or no, I'd lose it if this was a new 3D exploration-based Donkey Kong. Pretty much the game I want the most out of Nintendo these days (at least this side of Mother 4). I'd also take a new Donkey Kong Country game. Yes, over a new Metroid Prime. Sue me. @ricklongo Agreed, I would rather have a new DKC than a new Prime game. Tropical Freeze is probably my favorite Wii U game. Yes, I liked it more than SM 3D World. The platforming was difficult, but fair. Controls were spot on. Music was sublime. The Snowmads are much better adversaries than the Tikis. All it needed was some K. Rool. That being said, I wouldn't mind if this rumored game is something different altogether. Oh boy, I hope this is true! I don't care if it's DK or not- Whatever it is, I'm sure it will have an awesome soundtrack! ...which, we should warn you, contains some bad language. I really really hope retro aren't wasting their time doing more donkey kong stuff. Nintendo have a serious image problem that they're a kids console. They could really do with something more mature from retro. Preferably metroid related but a new I.P. would be cool also. Good god, don't let it be another freakin' Retro DKC game. The first one was great, the second one was not up to par imo. It doesn't make much sense, but I don't care much. Give me Diddy Kong Racing 2. That's about the only release that will help me forgive Retro for not fighting hard enough to make a new Prime-style Metroid game. The other release that would help me forgive them is a 2.5D Metroid game. lol. But I don't think they'd get David Wise for that soundtrack. Here's the thing about Diddy Kong Racing. The chief difference is that it is an exploratory adventure game mixed with a kart racer. That is very core-oriented for a kart game, IMO, and if that is the direction NX is going, then it makes a little bit of sense. I want that Taj the Elephant genie to say, "This is for you" when I get something... but that will never happen thanks to Rare... and really, that rumor feels way out there. @readyletsgo let's put it this way Donkey Kong Returns on the Wii sold more than the ENTIRE Metroid Prime trilllogy (the individual titles and collection) combined. He's "back"? More like he hasn't left. @abe_hikura haha oh I know that. Metroid my be a fan favourite but it sells terribly as a first party games. Hence why Ninty are not too pushed to take a huge chance on a massive story driven FPA game that won't sell much in the long run. And I get that. It's a little too soon for another DKC gme, but it wouldn't bother me as I loved Tropical Freeze, but it's a safe bet that it's for Diddy Kongs Racing 2, a launch title for the NX. Hmm i guess i'm the only one who would actually like another DK game. Well alrighty then. Interesting. 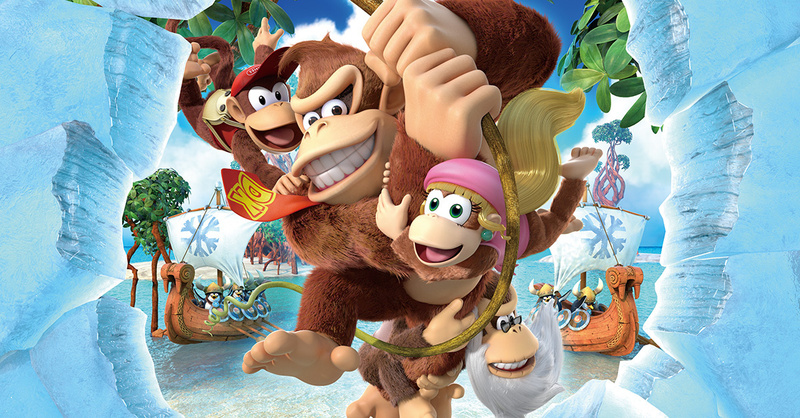 I actually think Tropical Freeze is the best of all the DKC games. And I've been an insufferable DKC2 fanboy since about 1996. I felt the music was excellent, the worlds and levels were very well-designed, and the art direction! Windmill Hill? Busted Bayou? Grassland Groove? Irate Eight? Harvest Hazard? Forest Folly? I was in awe at much of this game. Of course, to each their own. On topic? I would love to see a new DKC game. LOVE. @abe_hikura yeah, this is it. I never played Other M, I heard it was not up to Prime standards, and in fairness I still see new copies in Gameslop for no more than €10 max. So it bombed. I would say, if Ninty try another stab at Metroid it will be on the 3ds, something different from the normal Metroid, maybe call it Federation Force? See how that goes with the bigger wider audience on the 3ds then take it from there. I see what they are doing, and I agree with them as a very small side business idea, not much to lose on it. @abe_hikura yup I totally think the same thing. If it gets good reviews loads of people will try it even if they don't know the Metroid name. We already know Wise is working on Yooka-Laylee. I wouldn't imagine he's working on two games at once.... but I can dream. <3 I love Wise music so much. I wouldn't mind a new DK game after the perfection that was Tropical Freeze, and I imagine they're working on something DK or else something original or an old series revival when we know they can't be working on Metroid. I don't get why people are still going "UGH, not ANOTHER DK game maybe by Retro." They made three Metroid Prime games in a row too, y'know... no reason DK shouldn't also get a trilogy. The DK games they made were top notch and Retro should be known just as much as the best DK developer as they should be Metroid. Calm down. I don't get why Metroid fans keep acting like they're entitled to a new Metroid game by Retro, and nothing else would be acceptable. I'll take literally anything from them, Metroid, DK, or otherwise. Any series they touch is gold. @BLPs Exactly. Sony and Microsoft don't have a massively loyal fan base. Most of them will happily jump ship from each generation to the next without hesitation. Whereas Nintendo, even though they struggled recently, they still have a loyal fan base which is I think part the reason they lasted so long in the industry when Sega died. Rumors never really have a place with me, but I totally support another Diddy Kong Racing. If this ended up being true, however, then that's good. I never really played any Donkey Kong Country games other than Returns and Tropical Freeze. The latter has an absolutely amazing soundtrack, so I'd be more than happy having him compose for another game! Sometimes, I wonder how he does it. Tropical Freeze had some great songs but also some cheesy, forgettable, even irritating ones. His original works on DKC 2 and 3 were far superior. Oh boy, oh boy, I want a new Nintendo game soundtrack from David Wise! @Shiryu I just exploded IRL, my metical bill is $9001. care to spare $1 to help me afford it? I tell you guys: Retro is working on DK again! Its either a third DKC Returns, or Diddy kong racing 2. That they aren't working on Metroid is pretty obvious!